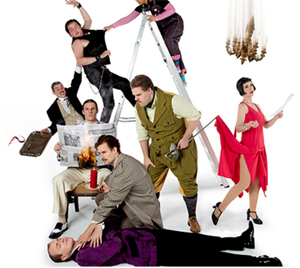 Mischief Theatre Production’s hilarious comedy, The Play That Goes Wrong, epitomises British humour at its best - the art of laughing at ourselves. The story revolves around an over ambitious amateur dramatics society (Cornley Polytechnic Drama Society); a bunch of am dram actors; an incompetent stage management team and a highly wayward set as they attempt to perform, dun dun duuuun... ‘Murder At Haversham Manor’. This ‘play within a play’ starts in the auditorium where we first notice a very stressed Chris Bean, the President of Cornley Polytechnic Drama Society/Director/Inspector Carter/Designer/Costume (Jake Curran), attempting to schmooze the audience while frantically searching for a missing cast member - Winston the dog! As the audience take their seats, the frantic search continues and this is when Trevor, the Lighting & Sound Operator (Gabriel Paul), informs us of his missing personal item, a Duran Duran CD. House lights remain up as we spy on the ‘behind the scenes’ preparations for curtain-up on ‘Murder At Haversham Manor’... dun dun duuuun. Throughout the play the audience connects with the characters on two levels. The first is as actors, playing ‘actors who have no acting skills’ and the second, as their characters within a murder mystery plot that you genuinely want to discover, who done it? We live through a murder mystery performance hampered by missing props, falling sets, missed sound cues, line fluffs, accidental falls, unwilling understudies, actors stepping out of character in the wonderful way a potential amateur actor ‘might’ behave on receiving their first laugh and applause. I had the good fortune to sit next to a 12 year old audience member. He very quickly understood what was happening and laughed out loud, with full belly laughs, throughout the 1 hour 20 minute show (not including interval). WHO SHOULD GO? The show was sold-out on the first night in Chester and I can see why. This is all-round family entertainment that doesn’t have a single swear word in it. Yes, you read that right! I strongly recommend rounding-up the whole family from Granny through to kids over the age of 8. It is an excellent night out and a fantastic introduction for children to Theatre. It is all good, clean fun guaranteed to have the whole family talking about it for years to come, and excellent value for money. TIP: Buy the programme, it is a great read as it is written in the style of Cornley Polytechnic Drama Society. Hilarious! High praise goes to Lucy Jenkins and Sooki McShane for their casting choices. Praise goes to Nigel Hook for his award winning Set Design - brilliant! And, most importantly, Mark Bell for directing his actors so expertly. Most Reviewers highlight outstanding performances from cast members, however, the ensemble cast of 12 are a well-oiled machine who work to precision timing. They make the impossible look easy. The bar is set very high with the standard of clowning and physical theatre, so that any actor who did stand-out would simply appear to be upstaging. The 2018 UK TOUR is currently in the heart of Chester at the multi-award winning Storyhouse, that sensitively takes a 1930s Odeon building and now houses a theatre, auditorium, boutique cinema, library, restaurant and two bars. Performances are until 3rd Feb, when it continues its travels around the UK, returning to the North West in June, at the Opera House, Manchester 25-30 June - see http://www.theplaythatgoeswrong.com for info.